In my previous post, I wrote that I was puzzled by that relation between the energy and the size of a particle: higher-energy photons are supposed to be smaller and, pushing that logic to the limit, we get photons becoming black holes at the Planck scale. Now, understanding what the Planck scale is all about, is important to understand why we’d need a GUT, and so I do want to explore that relation between size and energy somewhat further. I found the answer by a coincidence. We’ll call it serendipity. 🙂 Indeed, an acquaintance of mine who is very well versed in physics pointed out a terrible mistake in (some of) my reasoning in the previous posts: photons do not have a de Broglie wavelength. They just have a wavelength. Full stop. It immediately reduced my bemusement about that energy-size relation and, in the end, eliminated it completely. 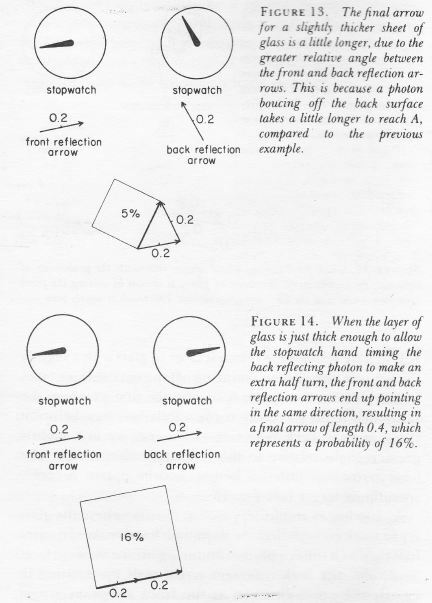 So let’s analyze that mistake – which seems to be a fairly common freshman mistake judging from what’s being written about it in some of the online discussions on physics. The Planck relation E = hν states that electromagnetic waves with frequency ν are a bunch of discrete packets of energy referred to as photons, and that the energy of these photons is proportional to the frequency of the electromagnetic wave, with the Planck constant h as the factor of proportionality. In other words, the natural unit to measure their energy is h, which is why h is referred to as the quantum of action. These are two very different things: photons do not have rest mass (which is why they can travel at light speed) and, hence, they are not to be considered as matter particles. Therefore, one should not assign a de Broglie wave to them. So what are they then? A photon is a wave packet but it’s an electromagnetic wave packet. 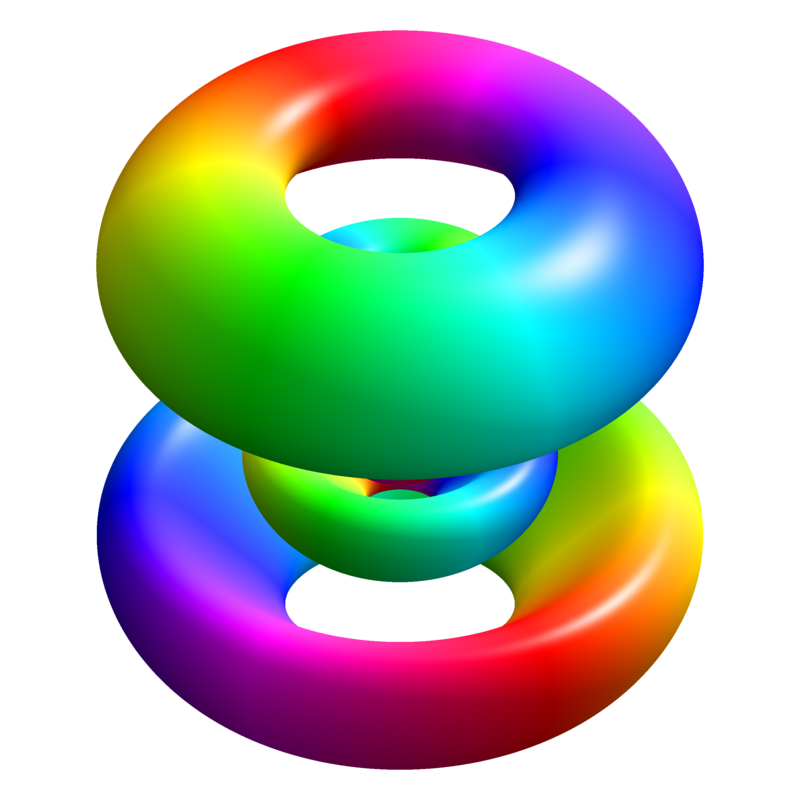 Hence, its wave function is not some complex-valued psi function Ψ(x, t). 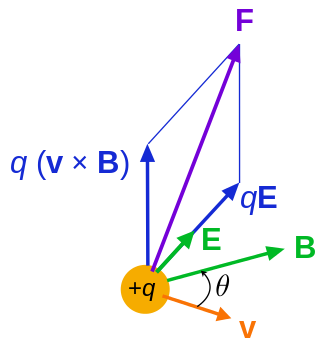 What is oscillating in the illustration below (let’s say this is a procession of photons) is the electric field vector E. [To get the full picture of the electromagnetic wave, you should also imagine a (tiny) magnetic field vector B, which oscillates perpendicular to E), but that does not make much of a difference. Finally, in case you wonder about these dots: the red and green dot just make it clear that phase and group velocity of the wave are the same: vg = vp = v = c.] The point to note is that we have a real wave here: it is not a de Broglie wave. 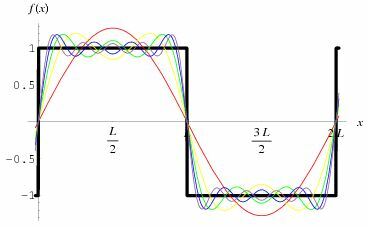 A de Broglie wave is a complex-valued function Ψ(x, t) with two oscillating parts: (i) the so-called real part of the complex value Ψ, and (ii) the so-called imaginary part (and, despite its name, that counts as much as the real part when working with Ψ !). That’s what’s shown in the examples of complex (standing) waves below: the blue part is one part (let’s say the real part), and then the salmon color is the other part. We need to square the modulus of that complex value to find the probability P of detecting that particle in space at point x at time t: P(x, t) = |Ψ(x, t)|2. Now, if we would write Ψ(x, t) as Ψ = u(x, t) + iv(x, t), then u(x, t) is the real part, and v(x, t) is the imaginary part. |Ψ(x, t)|2 is then equal to u2 + u2 so that shows that both the blue as well as the salmon amplitude matter when doing the math. So, while I may have given the impression that the Planck relation was like a limit of the de Broglie relation for particles with zero rest mass traveling at speed c, that’s just plain wrong ! 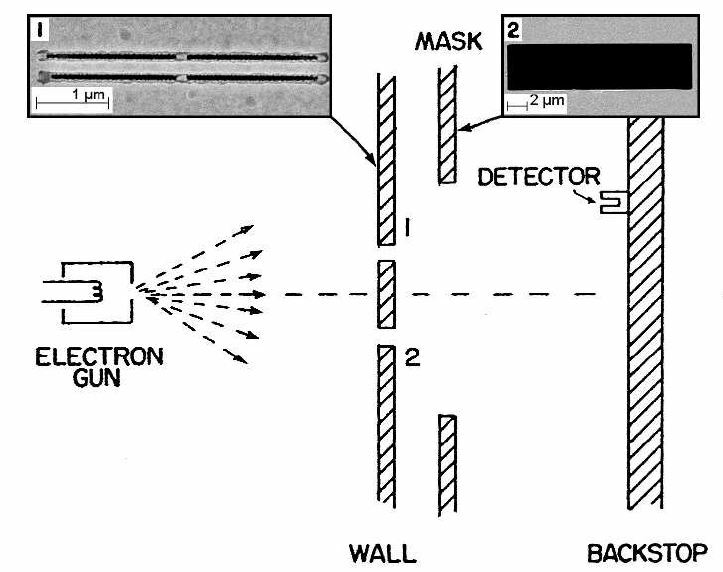 The description of a particle with zero rest mass fits a photon but the Planck relation is not the limit of the de Broglie relation: photons are photons, and electrons are electrons, and an electron wave has nothing to do with a photon. Electrons are matter particles (fermions as physicists would say), and photons are bosons, i.e. force carriers. Let’s now re-examine the relationship between the size and the energy of a photon. If the wave packet below would represent an (ideal) photon, what is its energy E as a function of the electric and magnetic field vectors E and B? [Note that the (non-boldface) E stands for energy (i.e. a scalar quantity, so it’s just a number) indeed, while the (italic and bold) E stands for the (electric) field vector (so that’s something with a magnitude (E – with the symbol in italics once again to distinguish it from energy E) and a direction).] Indeed, if a photon is nothing but a disturbance of the electromagnetic field, then the energy E of this disturbance – which obviously depends on E and B – must also be equal to E = hν according to the Planck relation. Can we show that? The energy of a photon is proportional to the square of the amplitude of the electric field. Such E ∝ A2 relation is typical of any real wave, be they water waves or electromagnetic waves. So if we would double, triple, or quadruple its amplitude (i.e. the magnitude E of the electric field E), then the energy of this photon with be multiplied with four, nine times and sixteen respectively. 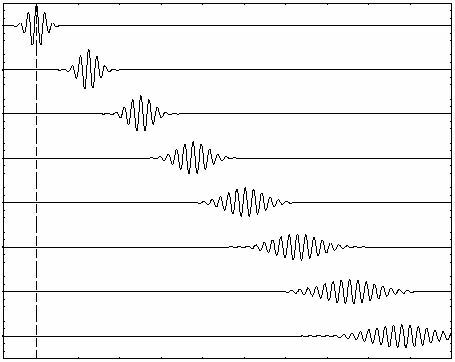 If we would not change the amplitude of the wave above but double, triple or quadruple its frequency, then we would only double, triple or quadruple its energy: there’s no exponential relation here. In other words, the Planck relation E = hν makes perfect sense, because it reflects that simple proportionality: there is nothing to be squared. 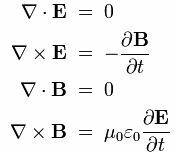 If we double the frequency but leave the amplitude unchanged, then we can imagine a photon with the same energy occupying only half of the Δx space. In fact, because we also have that universal relationship between frequency and wavelength (the propagation speed of a wave equals the product of its wavelength and its frequency: v = λf), we would have to halve the wavelength (and, hence, that would amount to dividing the Δx by two) to make sure our photon is still traveling at the speed of light. You will recognize all of the variables and constants in this one: the electric constant ε0, the distance r, the speed of light (and our wave) c, etcetera. The ‘a’ is the acceleration: note that it’s a function not of t but of (t – r/c), and so we’re talking the so-called retarded acceleration here, but don’t worry about that. Now, higher frequencies effectively imply a higher magnitude of the acceleration vector, and so that’s what’s I had to prove and so we’re done: higher-energy photons not only have higher frequency but also larger amplitude, and so they take less space. It would be nice if I could derive some kind of equation to specify the relation between energy and size, but I am not that advanced in math (yet). 🙂 I am sure it will come. Post scriptum 2: As I am re-reading some of my post now (i.e. on 12 January 2015), I noted how immature this post is. I wanted to delete it, but finally I didn’t, as it does illustrate my (limited) progress. I am still struggling with the question of a de Broglie wave for a photon, but I dare to think that my analysis of the question at least is a bit more mature now: please see one of my other posts on it.